Written by : Will Gluck, Alien Brosh McKenna, with stage play from Thomas Meehan, based on the comic strip, Little Orphan Annie, by Harold Gray. Synopsis: A spunky orphan gets adopted by billionaire. Singing, and dancing ensue. This review first ran at Central Track. On paper, Annie has most everything going against it. Seriously: It's a family-friendly remake of a musical that's being released right around Christmas time and was produced by Will Smith. Oh, and did I mention that it's a family-friendly musical? Only, see, here's the thing: It's not terrible. Like, at all. For one thing, the amazing Quvenzhané Wallis (Beasts of the Southern Wild) is tasked with playing the titular character. And she's just great -- especially when paired with an ensemble cast that looks to be having the time of their lives while shouting and singing along to updated remixes of the original soundtrack. Not familiar with the history of Annie beyond the Jay-Z sample? OK, here's the set-up: Annie is a plucky little orphan who lives in a foster home run by a terrible drunk has-been named Miss Hannigan (Cameron Diaz) and gets plucked away from poverty when she gets adopted by billionaire CEO, Mr. Stacks (Jamie Foxx). Of course, this being a modern update, there's gratuitous use of Twitter and Instagram throughout the film, too. These elements are integral to the plot here. Worth noting, however, is that there's no Facebook. So maybe this is really alternate reality utopia? It might be better than that, actually. She may not yet be household name, but Wallis certainly has a long career ahead of her. 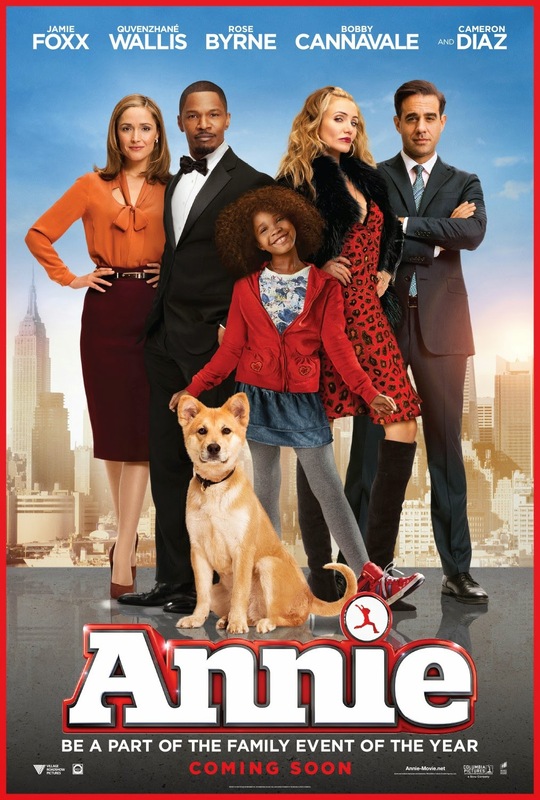 Her portrayal of Annie is an upbeat, charming, streetwise one. At the very beginning of the movie, when has a smart aleck answer to everything the teacher says, there's cause for concern that her personality will mostly be a grating one. Fortunately, this isn't the case. Put simply: Wallis carries the entire movie. Sure, her supporting cast helps plenty. But she's the best thing about the film. Her charm is something you have to see for yourself to believe. It's pretty special: She's one of those characters that tries to make the best out of any situation she faces -- and somehow does. But Annie wouldn't be anything without her Mr. Stacks (nee Daddy Warbucks) and his appropriate mix of campiness. And playing an eccentric, germophobic, millionaire CEO and mayoral candidate, Foxx shares a really believable chemistry with Wallis as their two characters search for humanity, purpose and opportunity in a difficult world. They're abetted well by the updated songs, which appropriately sidestep dubstep and other flash-in-the-pan genres du jour in favor of pleasant synth-filled tracks seemingly inspired by Pharrell's "Happy" and songs of that ilk. The only glaring weakness here is the script. Far too frequently, the dialogue comes off awkwardly. An example? When Grace (Byrne) talks to Annie about having friends, her rambling, too-long monologue stands as nothing but an over-the-top foreshadowing of a possible romance with Stacks. Too much here is just too obvious. Without a cast of this remake's caliber, it would be easy to see how this movie could flop. That said, this movie isn't for everyone. If you can't buy into the concept of a family-friendly vibe and some well-known actors acting intentionally goofy, you're not going to love this film. But if you can get past that, this movie will provide you a fun time at the cinema.